Ahhh! 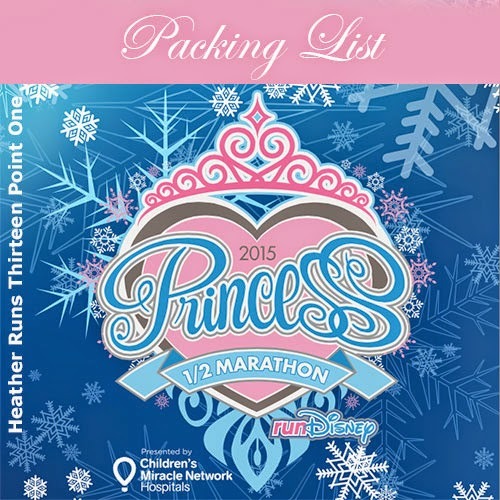 Can you believe Princess Half Marathon Weekend is THIS weekend?! As you prepare for your trip, I thought it might be helpful to provide a check list for items to pack for your run-cation. The weather for the 5k is looking like it might be a bit chilly (at least while standing around waiting to begin... and depending on how you are, the 10k and half might also be cold for you), so think about packing some layers, throw away clothes, or wearing a jacket that you can put in your gEAR check bag. I'm doing the 5k and the Glass Slipper Challenge, so I need to pack enough clothes and gear for 3 races. Anything you need that I don't have on my list? I'm in the camp of wanting to bring everything so I am prepared for whatever comes my way. Others are more minimalist – which are you? Awesome - love your list as well! Right - looking a lot like a repeat of January weather, which for waiting around wasn't my favorite (though if I were to just go running it was fine). That's quite the list. I'm like you. Take everything...just in case. So jealous! Enjoy every step.